On Friday I had the great pleasure of spending time with the illustrious Dr. Tom Rudolph, at Maryland Music Educators’ Association Conference. Tom was our distinguished Music Tech guest this year, and presented two phenomenal sessions on Finale and Smart Music. I have presented sessions at the Maryland conference for the last ten years, and usually find myself beating the same drum over and over again – children must be encouraged to compose in music class, and we as educators must work to foster and nurture their creativity. This year, I was actually invited to be part of a panel of four teachers, all showcasing their own successes with composing in the classroom. Maybe what I (and Scott Watson, and Jim Frankel, and Barb Freedman, and Will Kuhn, and Robin Hodson, and Matthew Etherington, and Rick Dammers, and Amy Burns, and Joe Pisano) have been saying for the last ten years is beginning to take root. I watched great presentations of ideas and student compositions from three different Maryland school districts, and they were all outstanding. 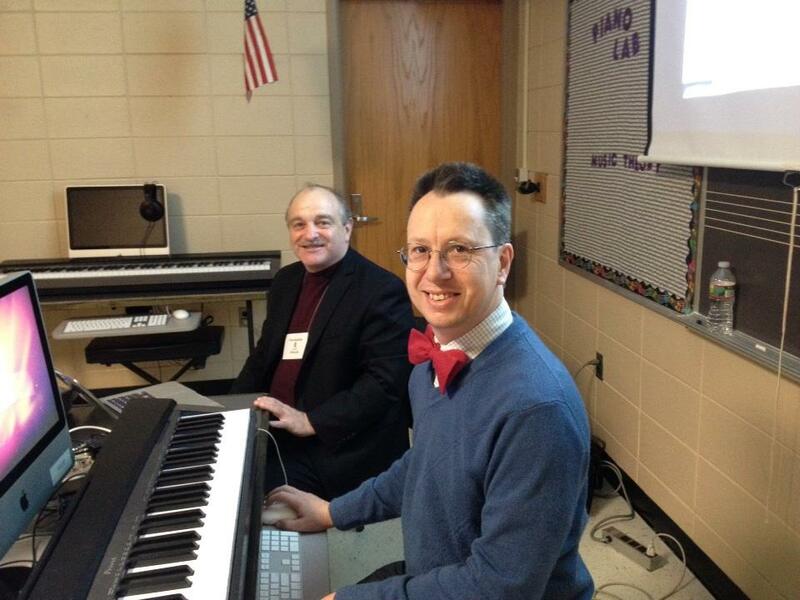 Ron Frezzo showed how he used graphical scores to inspire students. Chris Bassett showed how to take a holistic approach to planning out compositions and told us of the joys of running with parallel scissor-fifths. Michelle Roberts showed inspired use of sequencing software (Garageband and Reason). Michelle is the first teacher in Maryland whose students have won the NAfME/MENC Electronic Music Composition Talent Search – congratulations Michelle. Something that struck me during the day was how much we owe to the pioneering work of people like Tom Rudolph. Tom is one of the founding members of TI:ME, a hugely important organization in the training and development of Music Technology and Music Tech teachers. Throughout his career at Haverford Schools in PA, Tom used Music Technology to push the boundaries of what is possible. He continues to develop great strategies for the use of Music Technology software both in his own work and in his teaching. During Tom’s presentation, as he showed us the very impressive ways in which Finale can integrate with Smart Music and with Band-in-a-Box, I found myself in awe of his ease with the technology and how he was able to explain things so easily to a group of total strangers. Up until Friday, I thought Band-in-a-Box was dated software, but Tom showed some great new possibilities, which had me rushing home to reinstall the program on my computer. Even though Tom is now retired from teaching full-time, I can see how he continues to grow and learn in his own work, and then brings that to benefit others. During my own presentation, I was suddenly aware of the great connections in our growing Music Technology Education World – as part of my talk I demonstrated a composition project which I developed along with Mike Fein, himself a high-quality Music Technology teacher, and a former student of Tom Rudolph! Tom blazed the trail – I for one am glad to be able to follow in his footmarks.